Bakersfield, the Mexican street fare stop in Over-the-Rhine, prides itself on serving simple food in an upbeat atmosphere. Yes, the restaurant may use simple ingredients, but we argue that the plates skew toward the dynamic side. The Pollo Asado, especially, is an original take on a chicken taco. At the base, the corn tortilla is crisp around the edges yet soft and sturdy enough to hold the heap of toppings together. The tomatillo crema cools down the heat from the marinated chicken and provides an overall smooth consistency to the taco. With each bite, you get a crunch from the jicama, acidity from the pickled white onion, and earth tones from the black beans. The cilantro sprinkle is the perfect cap to refreshing plate. 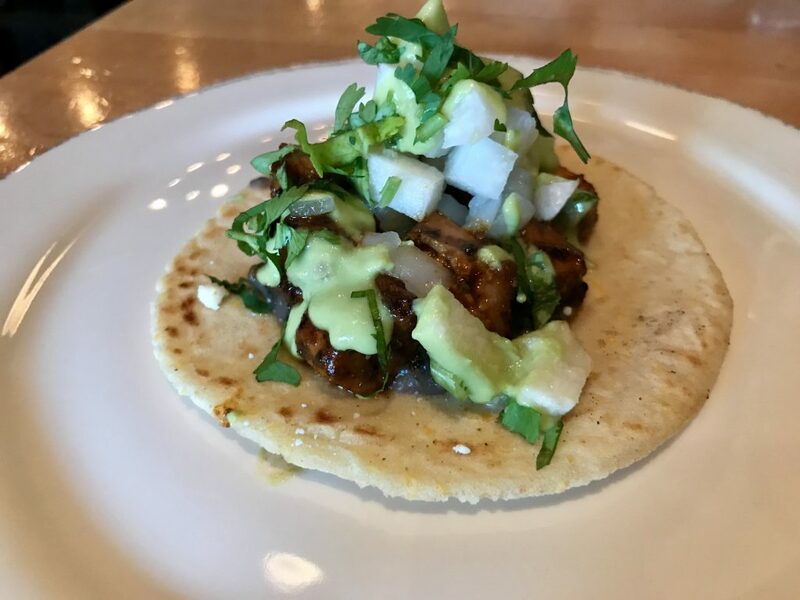 We know you’ll want seconds, and we recommend pairing the Pollo Asado with the Huitlacoche, a creamy “corn mushroom” taco. It’s technically corn fungus, but who’s counting.